What makes us one of the premier centers for brass study in the Southeast? 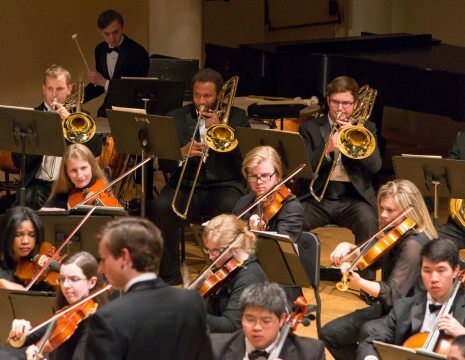 Faculty who are seasoned performers and dedicated teachers, a diverse array of performance ensembles, a tradition of producing successful alumni, and more. 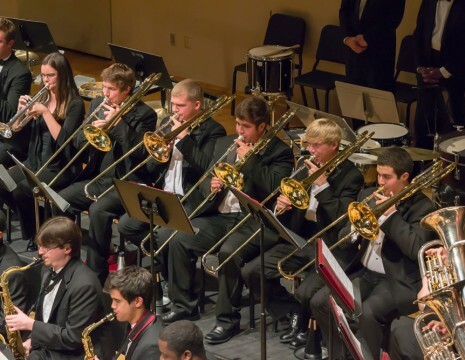 Brass students at The University of Alabama perform with the School of Music’s Huxford Symphony, the Alabama Wind Ensemble and Symphonic Band, the Jazz Ensemble, and the Contemporary Ensemble. 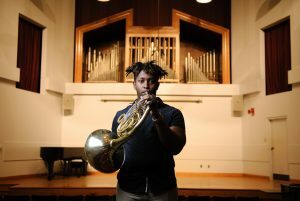 Various chamber groups also contribute to the performance outlets available to brass students at UA, with the studios maintaining an active horn ensemble, trumpet ensemble, trombone ensemble, and euphonium and tuba ensembles. There are also student brass quintets, brass quartets, and a brass choir. What are you currently studying at the University of Alabama? I am a candidate for a Doctor of Musical Arts degree in horn performance. How would you describe your experience in the DMA program thus far? My experience has been great so far! In addition to my own schedule as a student, I stay pretty busy with teaching. I teach Introduction to Listening, two sections of freshman ear training and six undergraduate private lessons a week. I absolutely love it. You’ve spent your time here studying under Prof. Skip Snead. How has your time with him shaped you as a performer? I owe a lot to Skip. I came into the program as a naturally talented, pro client operator of the horn. Skip has taught me to get past playing the notes on the page and to focus more on making music. What are some noteworthy performance opportunities you’ve had while here at UA? I have had a multitude of performance opportunities at UA. My favorite would be the time I performed with members of the St. Louis Symphony at the 2017 Mid-South Horn Workshop. In 2017, you were awarded First Prize in the International Horn Competition of America – Professional Division. Can you describe the experience and what it means for you going forward? The experience was life-changing! I played three genuine, heartfelt performances that weekend and my message clearly translated to the audience. It was great to see three months of consistent, detailed work put into action. As a result of this success, I have received several invitations to appear as a guest performer and lecturer. Most notably, I will appear as a featured artist at the 2018 International Horn Summer Symposium. What are your eventual career goals? I would love to do a bit of everything- college teaching, orchestral playing, solo playing, etc. What advice would you give to students considering a graduate degree in music? My advice would be to take advantage of the resources that are available to you in graduate school. Alec Wilder’s sonatas for horn and piano. I plan to record them within the next year or so.